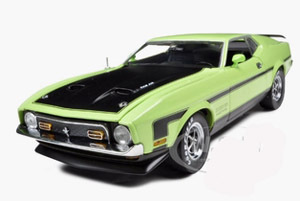 Here's the place to find your favorite Mustang Diecast Model of 1971-81 vintage. The early 1971 1972 and 1973 cars were featured in a number of movies, including Gone in 60 seconds, and Diamonds are forever (James Bond). 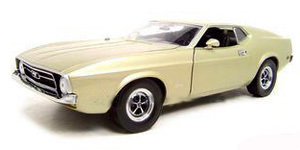 The later years, including the new fox body Mustang were not as prominent, but showed up in a number of movies and tv shows. These were the last of the real classic Mustang muscle cars, before gas rationing, new emissions and bumper laws spelled the end of the classic Ford Mustang. Click on the blue links for more information on your favorites, including prices. 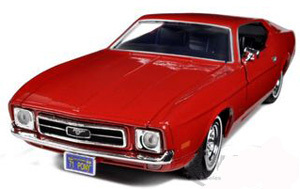 Some of the hardest to find 70's Mustang models, is the new body style 1971 Mustang Sportsroof or fastback. But this cool red pony car is a great and inexpensive way to start a collection. This 1971 Ford Mustang Sportsroof is decked out in the optional Magnum 500 wheels and popular sports roof or fastback style. Well detailed and just the right size at 1/18 scale. Here is a beauty. It's a 1971 Ford Mustang Boss 351 in Grabber Green paint, with the famous Boss 351 and inverted black "hockey stick" side stripe. The deluxe interior is nicely detailed, to look great on your showcase or desk. 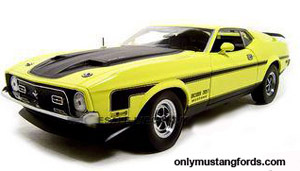 If you like the 71-73 Boss 351 cars, you can't go wrong with this nice, 1971 Mustang Boss 351 in grabber yellow. It's crafted in great detail at 1/18 scale. For some reason, the 1971 to 1973 Mustangs are even harder to find in diecast cars, than full size. 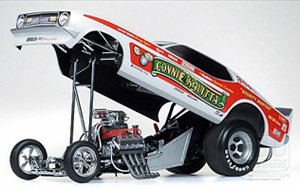 That's why I've included this very cool 1972 Nustang Connie Kalitta NHRA Funny car, the Bounty Hunter. With it's tilting body and detailed chassis, blower and headers, you'll want to be sure to include this piece of history in your collection. Stay tuned. I'll be filling in new model years of the Ford Mustang diecast cars as I find them. Still looking for Mustang ll and early fox body Mustangs in diecast model form. Still looking for the right Mustang dieacast model? Use the search box to find more information.